After having won three Eastern Conference titles and a NFL Championship in the four years from 1956 thru ’59, the New York Giants went 6-4-2 and dropped to third place in 1960. Looking toward the 1961 season, the Giants were facing several areas of concern. Two of the problems facing new Head Coach Allie Sherman were at quarterback and offensive end. While veteran Charlie Conerly had been a capable quarterback over the years, he was 40 years old and showing signs of wear. George Shaw had split time with Conerly in ’60, was found wanting, and sent off to the expansion Minnesota Vikings, and young prospect Lee Grosscup was too inexperienced. In addition, there were concerns about a lack of speed among the available receivers. In mid-August the first of those issues was addressed when Y.A. Tittle, an accomplished veteran who was five years younger than Conerly, was obtained from the 49ers. On August 28 the receiving corps was bolstered by the acquisition of split end Del Shofner from the Los Angeles Rams. The Giants traded the 1962 first draft choice that they had obtained from the Vikings in the deal for Shaw to LA in order to get the lanky (6’3”, 186 pounds) four-year veteran (the Rams used the draft choice to pick QB Roman Gabriel from North Carolina State). Shofner had come out of Baylor where he was a versatile player who, in his senior year, led the team in rushing, pass receiving, pass interceptions, kick returning, punting, and scoring. Taken by the Rams in the first round of the 1957 draft (ironically enough, with a draft choice they had obtained from the Giants), he was used as a defensive halfback during his rookie year and intercepted two passes. He was shifted to offensive end in ’58 with outstanding results as he led the NFL in pass receiving yards (1097) while catching 51 passes for a 21.5-yard average and eight touchdowns. Shofner followed up that performance by catching 47 passes for 936 yards (19.9 avg.) and seven TDs in 1959. He was a consensus first-team All-NFL as well as Pro Bowl selection after each season. 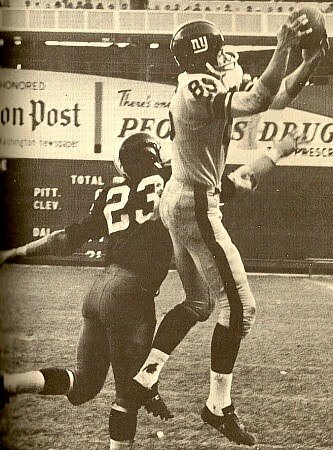 However, a pulled leg muscle kept him out of action for much of 1960 and he had only 12 catches for 122 yards (10.2 avg.) and one score. He still handled LA’s punting for the third consecutive season, averaging 42.6 yards on 54 kicks. The arrival of Tittle and Shofner paid dividends for 1961 and beyond. Tittle supplanted Conerly as the starting quarterback and had a Pro Bowl year, throwing for 2272 yards and 17 touchdowns. Shofner caught 68 passes for 1125 yards and 11 TDs, also garnering a Pro Bowl selection as well as consensus first-team All-NFL honors. The revitalized Giants narrowly topped the Eastern Conference with a 10-3-1 record although they were blown out in the NFL title game by the Packers. The combination of Tittle to Shofner remained effective in 1962 and ’63. In 1962 Shofner showed his toughness when, injured against the Steelers in the fifth game of the season, he was initially diagnosed with a broken shoulder that was expected to keep him out of action for six to eight weeks. Instead, he missed only one game and when he returned for a contest against the visiting Washington Redskins had one of the great receiving games in franchise history as he pulled in 11 passes for 269 yards and a TD. It was all part of a day in which Tittle threw for 505 yards and a record-tying seven touchdowns. Shofner went on to accumulate 53 catches for 1133 yards (21.4 avg.) and 12 TDs. He again received consensus first-team All-NFL and Pro Bowl honors. It was the same in 1963 as he pulled in 64 passes for 1181 yards (18.5 avg.) and 9 touchdowns. In his first three seasons with the Giants, Shofner caught 185 passes for 3439 yards, averaging 18.6 yards per catch, and scored 32 TDs. Along the way he had 13 hundred-yard performances and on four occasions caught three touchdown passes in a game. With Tittle having stellar seasons at quarterback, twice setting new NFL records for touchdown passes in a season and receiving MVP recognition in each of the three years, and with a solid and well-seasoned defense, the Giants topped the Eastern Conference each time. However, they failed to win the NFL Championship, twice losing to the Packers and, in 1963, to the Bears. That last loss was perhaps the most galling as Tittle suffered a knee injury that hindered his effectiveness and Shofner missed a first quarter pass in the end zone that could have given the team a 14-0 lead. In any event, the title game loss in ’63 marked something of a turning point. The Giants crashed in 1964, falling into last place with a 2-10-2 record. It marked the end of Tittle’s Hall of Fame career and, among others, Shofner suffered through an injury-plagued campaign, appearing in just six games and catching 22 passes for 323 yards and no touchdowns. He remained with the Giants until 1967 but suffered from an assortment of injuries and had much-reduced production. In contrast with his first three stellar years in New York, over his last four seasons Shofner had 54 receptions for 876 yards (16.2 avg.) and three touchdowns. Still, the first three great seasons justified the trade that brought Shofner to the Giants. He stretched the field and provided Y.A. Tittle with a potent deep threat. A thin and unlikely looking pro football player, Shofner had a great combination of speed, hands, and savvy as a receiver. When his 11-season career came to an end, he had caught 349 passes for 6470 yards, an 18.5-yard average gain, and 51 touchdowns. In addition, he was a consensus first-team All-NFL and Pro Bowl selection following five of those seasons.